Our Womens Replica Home Jersey is your opportunity to own the same on-field design worn by the players in the 2018 season. 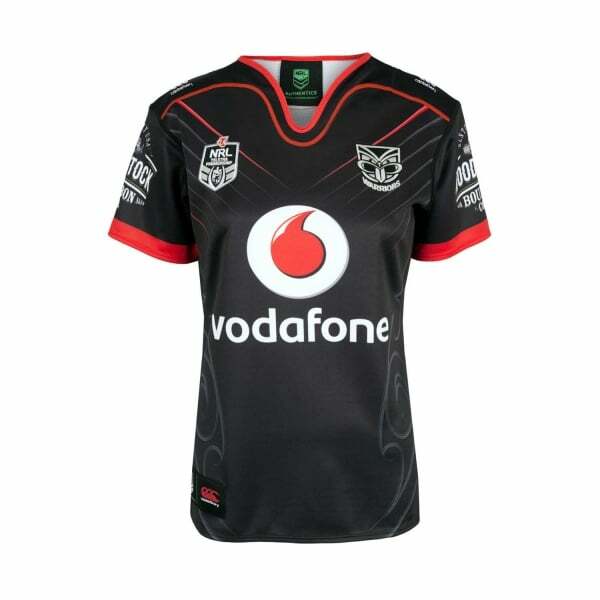 So if you’re a Vodafone Warriors fan, order yours now to avoid disappointment! Canterbury’s Womens Replica Home Jersey is a garment every female Vodafone Warriors supporter needs in their wardrobe. It features the same on-field design worn by the players in the 2018 playing season and is made with 100% Polyester pro-jersey knit 245gsm for a comfortable, stylish and contemporary fit. It has embroidered team and sponsor logos at the chest and an NRL locker tag at the right front hem, so there’ll be no doubt who you support whenever you wear it. The jersey also features the Vodafone Warriors powerful Home Koru Design, which embodies strength, protection, growth and teamwork. A limited edition collector’s item that won’t last long, order yours now at Canterbury.